In my never ending search for the perfect Chocolate Cream Pie, I came across a Sunset recipe which seemed promising. I think I might have found the best Chocolate Cream Pie yet. What I like about this pie is that the chocolate filling is a little richer than most and calls for actual chocolate rather than cocoa. Cocoa is convenient, but I happened to have some Lindt Intense Chocolate (70%) on hand and it worked beautifully here. Also, it’s nice to know you can vary the flavor by using different chocolates. The crust is a basic graham cracker crust, and for the topping I just whipped up some cream and sweetened it with a little sugar. This is a great pie for those of you who aren’t crazy about meringue. I posted the full recipe below. However, I also posted a scaled down smaller version. I reduced Sunset’s recipe by 2/3 and made it in my trusty Marinex 7-Inch Fluted Small Round Pie Pan so there’d be just enough for 3. Scaling down the recipe was successful, so if you need to make the pie smaller, you can use the scaled down version. The best ever chocolate cream pie! Try it and see if you agree. Whisk the egg yolks together in a mixing bowl and set the bowl next to stove. In a medium saucepan set over medium-high heat, stir together sugar, cornstarch, and salt, then whisk in the 3 1/4 cups milk. Bring to a simmer. Whisk about 1/2 cup hot milk mixture into the bowl with the egg yolks, then pour the egg yolks back into the saucepan. Continue whisking until mixture come to a boil and starts to thicken. Reduce heat to a gentle boil and whisk for another 2-3 minutes. Remove from heat and stir in chocolate, vanilla, and the 2 teaspoons butter. Pour chocolate filling into a medium metal bowl, then set bowl in a larger bowl of ice and cold water and let cool 5 minutes, stirring constantly, until filling reaches room temperature. Pour filling into prepared crust and cover with plastic wrap or a piece of well-buttered foil, pressing it directly onto surface to prevent skin from forming. Chill until cold, at least 3 hours and up to 1 day. 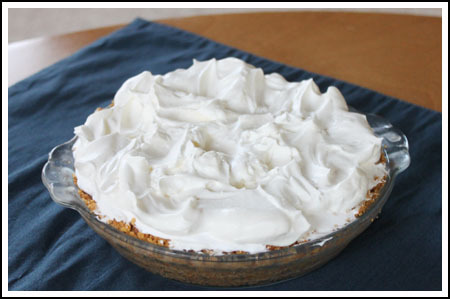 Just before serving (or you can do this as soon as the pie is cold), whip the cream and spread freshly whipped, sweetened cream (or whipped topping) over top. For the crust, use your favorite recipe. I generally use 1 1/3 to 1 1/2 cups crumbs, 1/3 cup sugar (sometimes less) and about 1/3 cup butter and bake for 8-10 minutes. To help loosen the pie from the pie plate, set the cold pie in a rimmed baking sheet filled with hot water. The heat from the hot water will melt the cold butter somewhat and make it easier to lift it. Preheat oven to 350 degrees F. Rub a 7 inch pie dish with butter. In a bowl, stir together the graham cracker crumbs and sugar. Add the softened butter and stir until mixture it moist. Press into bottom and up sides of pie dish. Bake for 8 minutes. Whisk the egg yolks in a bowl and set bowl next to stove. In a medium saucepan over medium-high heat, stir together 1/4 cup sugar, cornstarch, and salt, then whisk in the milk. Bring to a simmer. Reduce heat to medium. Whisk about 1/2 cup hot milk mixture into egg yolks, then pour egg-milk mixture into saucepan. Whisk and stir until mixture thickens, then continue whisking for another 2-3 minutes. Remove from heat and stir in chocolate, vanilla, and the 2 teaspoons butter. Pour chocolate filling into a medium metal bowl, then set bowl in a larger bowl of ice and cold water and let cool 5 minutes, stirring constantly, until filling reaches room temperature. Pour filling into prepared crust and cover with plastic wrap or a piece of well buttered foil, pressing it directly onto surface to prevent skin from forming. Chill until cold, at least 3 hours and up to 1 day. Just before serving, spread freshly whipped, sweetened cream (or whipped topping) over top. This comment is for Stephanie, who had a question. Stephanie, I emailed you the answer but the email bounced back. If you see this, please email me using the contact info so I can answer your question about the pie. Glad you liked it! Thanks for the review! I fixed the typo in the directions. What happened was I carried that part of the directions over from the small version which uses 1/4. Glad you did it right. And yes, chocolate is always chopped. I’ve been searching for a long time and have made some very good chocolate pies..but today my search ended — it won’t get better than this, this is definitely THE BEST chocolate cream pie EVER. I used Scharffen Berger Dark Chocolate, but can’t wait to try some others. Just a note for someone who may not have a lot of experience: whatever bar chocolate you use, be sure to chop it up BEFORE adding, the finer chop the better, it will blend in quicker. And as far as I can tell there’s a misprint in the directions: it says to add 1/4 C. sugar, but the ingredients list calls for 3/4 C sugar– I used 3/4 C and it was just right. Thanks for this great recipe Cookie Lady –I am bookmarking this site!! I’d love to hear your results making the pie in a store-bought crumb pie tin. From looking at the volume of filling I got, I think this recipe would work quite well in the standard size store-bought crust. You might have to augment it with a little more whipped cream, but I do think it will fit. I have a small store-bought OREO crust (not sure if it measures 7″) on hand, so I’m going to make this tonight using it. Hopefully the chocolate-y pie crust won’t be overkill! There’s a link to the full version, but I guess it’s a little hard to see on some monitors. Here’s the link again. This makes a 9 inch pie. Would love to have the full version for a 9 inch pie!! !By the way, I love your website and recipes!!!!! Welcome to Austin!! 2 teaspoons (as listed in the ingredient list) is correct. Hi! This looks so yummy! I may have mis-read, but do we use 2 tsp. of butter (as in the list of ingredients) or 4 tsp. of butter (as in the instructions)? Thanks! Can’t wait to try this one. By the way, I just moved to Austin!!!! Anna, this look so so good. Give me whipped cream on a pie over meringue any day. I like the idea of the smaller pie plate too as it’s usually just my husband and I eating all this good stuff. I want a piece now! 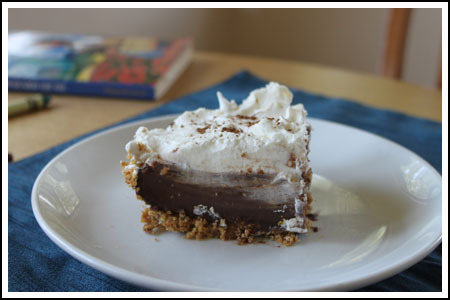 I have a friend who LOVES chocolate cream pies, I so have to make this for him! Thanks! I love it! Just the name “chocolate cream pie” makes me swoon. Sorry about the faulty link. I think it’s fixed now. I bought my fluted pie dish off Amazon for about $7. It’s great! Where did you get your 7-inch pie pan? It would good for me, since it’s just my hubby and I in the house. I’ve looked around at a few stores in the area, but haven’t found one. So should I try this one or the Luby’s one? I agree ,bring on the whipped cream! How could you go wrong ? Looks sooo good ! I will be making this soon ! Thanks for sharing ! I am also on the search for the perfect chocolate cream pie. I am going to give this one a try. It looks great! We need one of those smaller pie plates! Although, we could probably devour an entire cream pie in record time. Agree with you about the whipped cream instead of meringue – this pie looks just glorious!